The College of Arts and Sciences (A&S) lauds the 200th anniversary of the publication of Mary Shelley’s “Frankenstein” with a daylong reading of the entire novel. On Wednesday, Oct. 31 (Halloween), more than 60 readers from the University—students, faculty and staff, including A&S Dean Karin Ruhlandt—will participate in a global read-a-thon, aptly called “Frankenreads.” The event will take place on the Einhorn Family Walk, near the entrance to the Schine Student Center, from 8:30 a.m. to 7 p.m.
Frankenreads is free and open to the public. Attendees may drop in at any time or stay for the entire event. The Department of English is overseeing SU’s role in the celebration, which, in turn, is organized by the Keats-Shelley Association of America. For more information, contact Mike Goode, associate professor of English, at 315.378.9252 or mgoode@syr.edu. Goode says that, despite its enduring appeal, “Frankenstein” is a peculiar novel. “[The first edition] had a small print run, meaning that few people knew about Mary Shelley’s story of a scientist who brings the dead back to life,” explains Goode, a specialist in late 18th- and early 19th-century British literature and culture. He says that a series of loose theatrical adaptions in the 1820s fired the public’s imagination, transforming Shelley’s so-called problem child into a cultural phenomenon. “‘Frankenstein’ soon became a buzzword for an inventive idea that assumes a life of its own. By 1831 [when the second edition was published], Shelley called her creation a ‘hideous progeny,’ on account of the life it had taken on apart from her original story,” Goode continues. For the past month, readers of all stripes have signed up for 10-minute slots to honor Shelley’s classic in its original, 1818 form. Among them is Ruhlandt, reading from 5-5:10 p.m. The response does not surprise Goode, citing the novel’s staying power. He attributes part of the appeal to Victor Frankenstein’s “monstrous, yet sympathetic creation,” which means different things to different people. 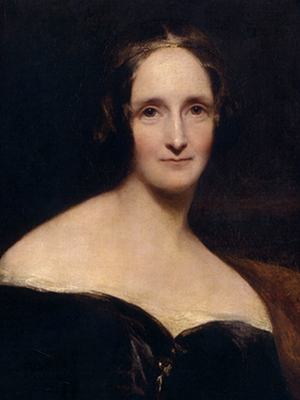 Born in London to well-to-do parents (her father was an eminent philosopher), Shelley was barely 18 when she started writing “Frankenstein,” originally titled “The Modern Prometheus.” By then, she had eloped with poet Percy Bysshe Shelley and had given birth to two children. During the “Great, Cold Summer of 1816,” the Shelleys found themselves holed up in Lord Byron’s villa in Geneva, Switzerland. They passed the time reading ghost stories aloud, while spinning their own yarns about the macabre. (Among them was physician John Polidori, whose short story “The Vampyre” later influenced Bram Stoker’s “Dracula.”) Grieving the recent stillbirth of her daughter, Shelley was in the throes of writer’s block. Inspiration came to her in a dream. 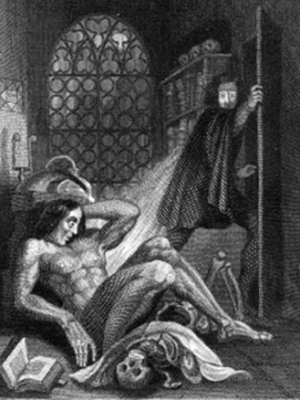 The frontispiece of the 1831 edition of “Frankenstein,” featuring the first visual depiction of Victor Frankenstein and the Creature. “I saw the pale student of unhallowed arts kneeling beside the thing he had put together. I saw the hideous phantasm of a man stretched out, and then, on the working of some powerful engine, show signs of life. … What terrified me will terrify others,” she wrote. In the novel, Victor Frankenstein is the proverbial “mad scientist”; his creation is referred to as “monster,” “creature” and “demon.” Critics panned the original, anonymous edition, but embraced the 1831 follow-up, bearing Shelley’s name. 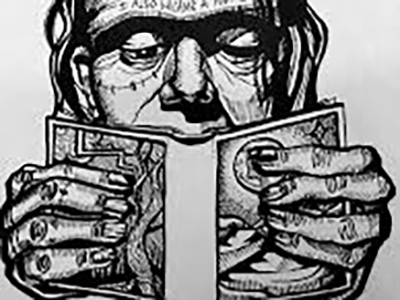 Frankenreads is the marquee event of “Frankenweek,” running Oct. 24-31. Funded by a Chairman’s grant from the National Endowment for the Humanities, Frankenreads includes a free, public, livestreamed reading of the full text of “Frankenstein” on Oct. 31 in the Thomas Jefferson Building in Washington, D.C.’s Library of Congress. More information is available at frankenreads.org.